At the Toshiba Stroke and Vascular Research Center in Buffalo NY, Dr. Ciprian Ionita and his team have developed a novel method to create 3D-printed vascular models (or "phantoms") using Polyjet printing technology from Stratasys. 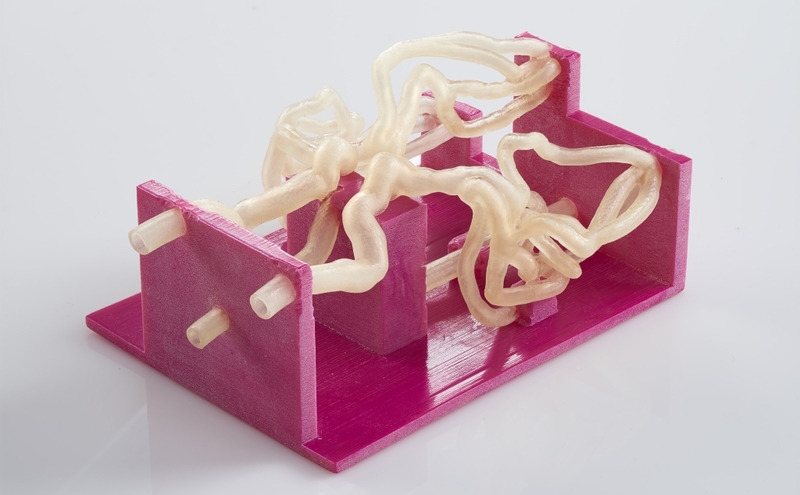 These models of the brains vasculature (blood vessels) are being used for surgical training and planning. Dr. Ionita collaborates with Dr. Adnan H. Siddiqui, Chief Medical Officer of The Jacobs Institute, who is using the phantoms when planning complex neurosurgery procedures such as repair of brain aneurysms. The process of creating a vascular phantom begons with a CT scan of the patient's brain. The volumetric scan data is imported into Vital Images' Vitrea software, a tool for exploring and segmenting medical data. 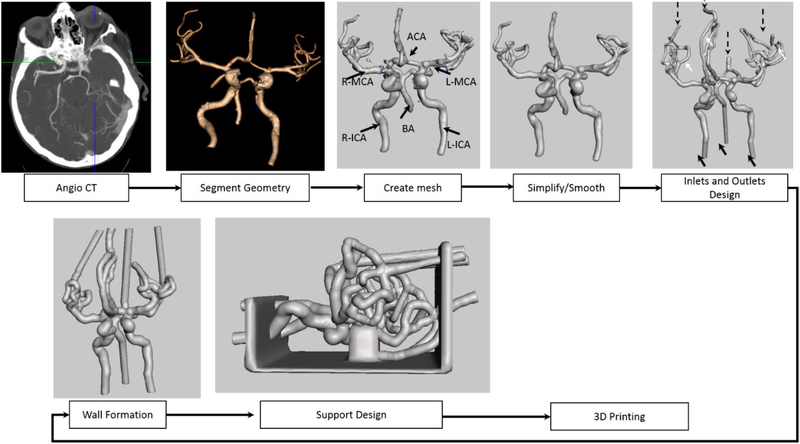 Biomedical engineers extract the critical regions of the vascular (blood vessel) network as 3D surfaces, and export the result as a standard triangle mesh. This mesh is then imported into Autodesk Meshmixer. In Meshmixer, the raw vessel meshes are cleaned up - holes are filled, tiny unprintable vessels are removed, and so on. Then, the vessel walls are thickened and combined with a supporting structure, so that they can be printed. Dr. Ionita's team has published several papers about their workflow  . Once the phantom has been designed, it needs to be fabricated. Ultimately the goal is to produce a physical model that is as close to the "feel" of real tissue as possible. The Buffalo team relies on Stratasys' multi-material Polyjet printers, which can combine translucent flexible regions and rigid plastic regions in the same print, as shown in the image above. In some cases the model is used primarily for inspection - it is much easier for a surgeon to understand the spatial configuration of the blood vessel network when looking at a physical model, compared to a 3D rendering. The Buffalo team has taken 3D-printed patient models a step further, and is using the phantoms in a surgery simulator. This allows the neurosurgeon to directly practice a procedure, such as an aneurysm repair or clot removal. The simulator setup is shown in the image below. Fluid is pumped through the phantom, simulating blood flow. 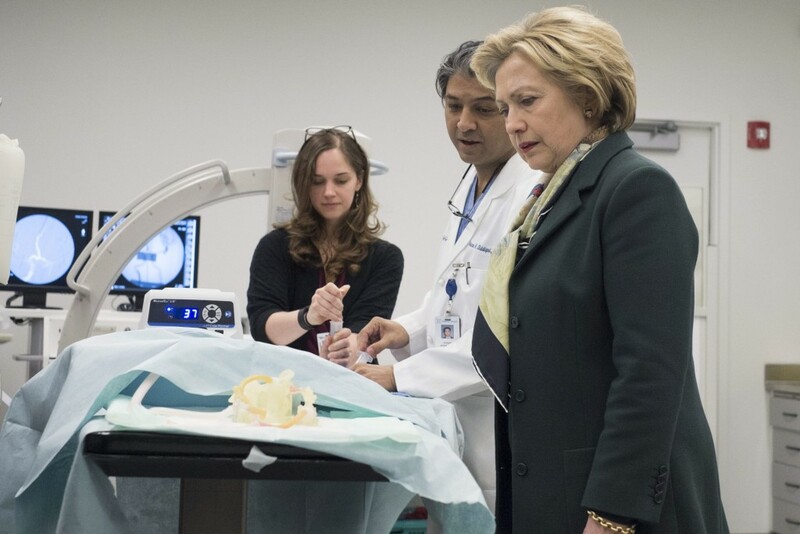 The surgeon does not directly look at the print, instead they look through a live X-ray feed, which is what they will have during the operation. The procedures involve feeding a catheter (think long, flexible wire) up through the body into the brain - the inlet labeled "9F Sheath" is where this would happen. For neurosurgeons like Dr. Siddiqui, being able to practice procedures can literally save lives. In the video below, Dr. Siddiqui explains a case where the simulator allowed him to identify an issue with a surgical plan. As a result, potentially life-threatening complications were identified before the patient was on the operating table. In the video below, Dr. Adnan H. Siddiqui from the Jacobs Institute describes how a 3D-printed vascular phantom helped to save a patient's life. This video was produced by Stratasys Corporation.